What are crazy, hairy ants? Are they referred to as Rasberry Crazy Ants or Caribbean Crazy Ants? These are probably all one and the same species Nylanderia pubens with multiple common names. Rasberry crazy ants were first found in Texas in 2002. They are believed to be related to a species from the Caribbean. 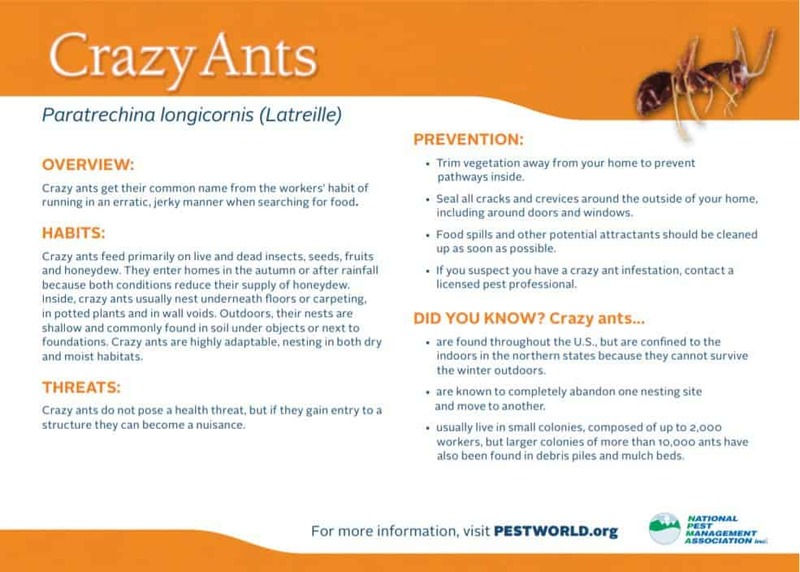 Caribbean crazy ants are found in Florida – have likely been there since the 1950’s but pest professionals have been receiving more and more reports since 2000. The more common Crazy ant (Paratrechina longicornis) looks similar to the Rasberry and Caribbean crazy ants, but have marked differences. Their antennae and legs are significantly longer and their bodies are slightly larger. 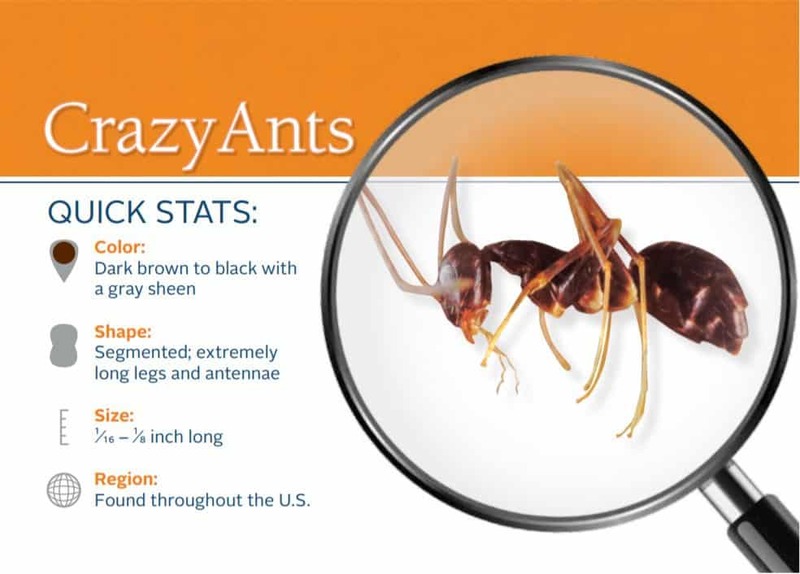 Their populations are also more spread out around the U.S.
Why are they called “crazy” ants? Crazy ants get their common name from their habit of running in an erratic, jerky manner when searching for food. Is there a specific reason these ants are a problem this time of year? Crazy, hairy ants are an invasive species by definition so are very good at invading new areas. Ants react to drought and rainfall in different ways so weather can play a role in their movement. Additionally, they are very good hitchhikers and can be transported to new areas as stowaways in cargo. Where are these ants found? In the U.S. these ants are found in South Florida, Louisiana, Mississippi, Houston and surrounding areas of coastal Texas. These ants prefer tropical/semi-tropical climates. Colonies typically grow in warmer months with populations peaking in August/September. Their numbers remain high through October and November. Although these ants usually nest outside, they will forage indoors in large numbers in cooler temperatures or after rainfall. Inside, crazy ants usually nest underneath floors or carpeting, inside wall voids and soffits. Extremely large colonies resulting in massive infestations which can be difficult to treat, often requiring multiple treatments. Colonies may grow to about 1 million. These ants also have an odd propensity to nest in electrical boxes and around electrical equipment, causing short - outs and electrical equipment failure. Are these ants harmful to humans and/or pets? Crazy ants feed primarily on live and dead insects, seeds, fruits and honeydew. They are capable of biting, but it’s rare. It’s the size of their colonies that poses the biggest problem. What can homeowners do to prevent infestations? Seal points of entry around the house including small openings and cracks around doors and windows. Clean up food spills, keep honeydew in closed containers in the fridge and remove other potential attractants as soon as possible. If you suspect an infestation, call a professional to evaluate the best course of treatment.